A person with shortsightedness can see close objects clearly, but may have trouble seeing objects from a distance – like a road sign, blackboard, or face across the room. It’s a common condition, affecting 1 in 4 adults worldwide. 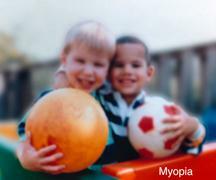 Shortsightedness or myopia happens when the eye has a long shape, which causes light rays to focus too far in front of the retina, making distance vision difficult. 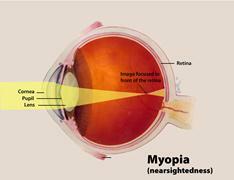 Like Longsightedness, myopia can be inherited. It is often discovered when children are 8 to 12 years old. During the teenage years, when the body is growing rapidly, it can get worse. Typically, between ages 20 and 40 there is little change. Spectacles and contact lenses: The simplest treatment option chosen by most people. PureVision2 HD contact lenses feature HD Optics that deliver the clear, crisp vision that you should demand – designed to reduce halos and glare – especially in low light. Ref: Results from a 21 investigator, multi-site clinical study of PureVision 2 and PureVision lenses. After 7 days of daily wear, subjects completed an online survey regarding lens performance. A total of 339 experienced silicone hydrogel wearers completed the survey. Consumers rated the extent to which they agreed or disagreed with performance attributes that used a 6 point scale (1=strongly disagree and 6=strongly agree). Consumers also rated it against their habitual lenses. Surgery: Surgical options are available, but can be expensive, and may involve more risk than contact lens options available. These procedures use laser technology or manual incisions to remove small amounts of tissue from the cornea.